High strength aluminium alloy and up-to-date miniature electronics giving lightweight and compact units. Designed to take a shackle each end providing solid anchor points. Technical Data - Accuracy: +/- 0.2% of normal capacity. - Battery life - 250 to 700 hours depending on model. - Weatherproofed to IP65. - Operating temperature: -10°C to + 50°C. - Temp. compensation: automatic zero adjustment when equipment free load is switched ON. Comes in six capacities: 0.5T, 1T, 2T, 3.2T, 5T and 6.3T. The LLX2 display attaches securely to the sensor unit or can be held in your hand for remote operation. Tractel's patented system for shackle and chain compatability makes the Dynafor LLX2 directly compatible with traditional shackles and with accessories for all standard chains currently on the market. The two axes of the sensor are crossed, enabling movements of lifting accessories on both sides, thus avoiding stresses due to load movements and enhancing appliance precision (Coplanar version available on request). Sensor battery life: 300 to 1000 hours, depending on functions used, and 3000 hours while on standby. The Dynafor LLX2 uses a single model display for all models, ensuring high utilisation and flexibility. The optional PC Connection Kit (PC to LLX2 via USB) allows advanced processing of measurement data. 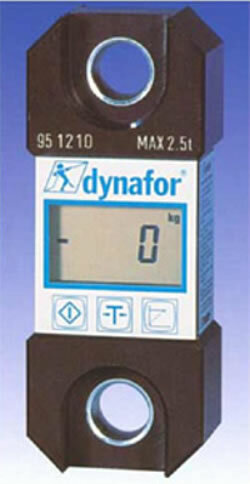 The dynafor™ LLXh (h for hybrid) are precision appliances for measuring pulling force and indicating loads. They combine the proven mechanical body of the LLX with the new electronic software from the LLX2. 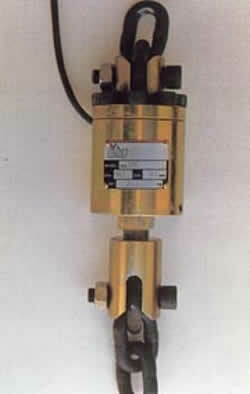 They are precise within +/- 0,2 % and are available from 15T (150kN) to 250T (2,500kN). The Dynafor LLZ dynamometers are a range of electronic dynamometers with digital readout for pulling and lifting applications. Using strain gauge sensors, the LLZ are designed for use between shackles or brackets. These units operate in all positions for force measurement and vertically for load checking and measurement. 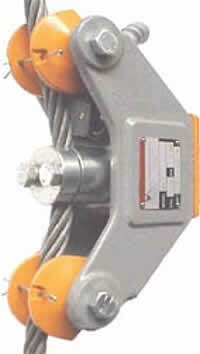 For use on multi-fall cranes and hoists. 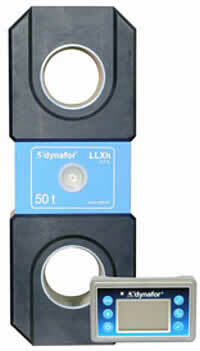 These limiters have two switches, one for use when a warning is required prior to overload cut-out activation. For use on wire rope where a pre-set minimum tension is required. For use on hoisting systems where minimum and maximum loading must be monitored e.g. Ship Loading Boom. For most chain hoists. Easy to install with no special tools needed. Minimal maintenance required.